Word is spreading around the world as some countries report that their Nokia N9 has finally received the PR 1.2 firmware update. Finland, Brazil and Sweden Nokia N9 users have reported the firmware has appeared on their phones. No news yet from other Australian fans. Not sure how to check if your N9 phone has the update? Go to Settings -> Applications -> Manage Applications -> tap on the bottom right icon -> tap on the top righ icon to refresh. 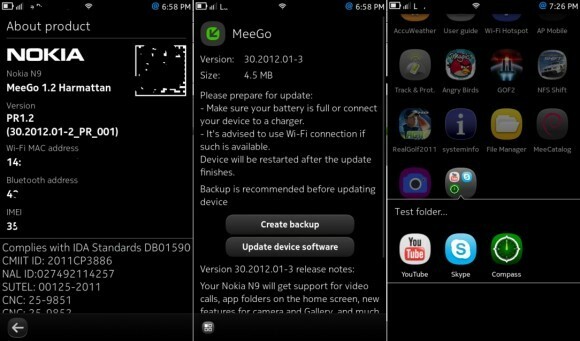 Have you got the N9 firmware update? let us know what you think of it. No update in Canada... But I'm wondering, is it based on the real location where you are, or does it depend on the image you use? Swedish N9, 64 GB - I have it now! It's downloading the update, going to install it soon. Singapore - No luck. Neither an OTA notification on device and nor possible via Nokia Software Updater (v3.0.605) on pc. Available in Holland! Previous firmware BENELUX N9 (059J1V5). Phone bought in Denmark,currently in Macedonia. No update yet. Downloaded and installed it here in Finland! Several apps updated at the same time. The size of the package was several hundred mb, better use wifi! Tried it here in Finland. Navigation is better, has the "normal" functions like "home" and favourites amongst other new features. Looks like it is turning into a proper navigator. Camera has a "torch" button, which sets the flashlite on. Folders on home screen is a practical improvement, amount of icons on the screen started to be too much already! Belgium: available. Installed over wifi without problems, will test later. any1 got an update in australia?????????????? I'm installing MeeGo upadate v30.2012.07-1 right now. I've started it an hour ago. I knew that the update will take about 40mins so I leaved it. When I came back, I saw the update notification again. What happened? Then I started to click the update button again. I hope this time the updates will installed successfully. Btw, I'm here in China. Its not yet available in Abu Dhabi(UAE), still showing device up to date ??????? Not released in UAE I dont know the reason ???!!! !